Move the potted moonflowers to an outdoor cold frame or an area of the home that stays between 45 and 50 degrees Fahrenheit the day after the last frost of spring. Reduce the moonflowers’ watering frequency by one-half or more, watering just enough to prevent wilting. Although moonflowers can handle a brief dry spell, you don’t want to dry them out. Work the soil 12 inches deep in an area that receives full sun, next to a trellis, fence or post, that's at least 6 feet tall, using a spade fork. If you don't have a trellis, install one in the soil you worked. If you are using posts, space the posts 15 to 16 inches apart from each other. Spread 2 to 4 inches of compost over the soil to improve its drainage, if you have poor-draining soil. Work the compost into the soil 8 to 12 inches deep. 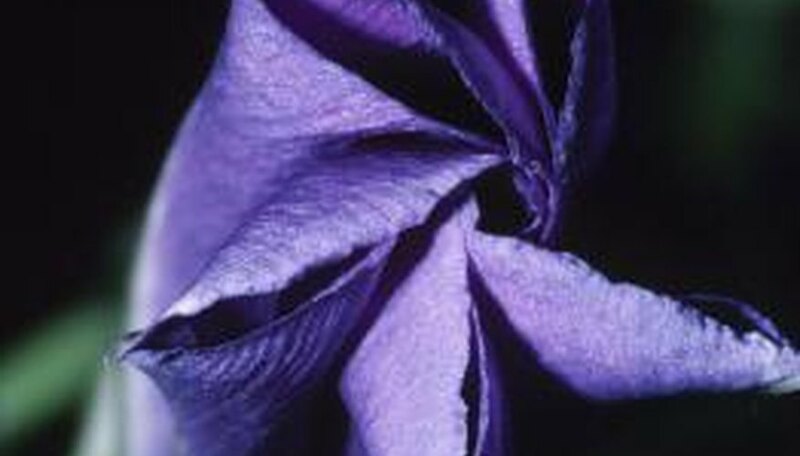 Dig one tapering hole for each moonflower equal to the peat pot's height and 1 to 2 inches wider than its diameter. Space the holes 15 to 16 inches apart from each other. If you didn’t start the moonflowers in peat pots, gently dig them from their containers, using a spoon. Untangle the roots by hand. Dig holes in the soil you will transplant the moonflower seedlings to, using a spoon. Make the holes deep enough so the moonflowers will sit at the same level they did in their containers. Tear the lips from the tops of the peat pots. Place the pots in the holes. Add or remove soil, as needed, so the tops of the growing medium in the pots sit flush with the surrounding soil. If you are planting seedlings without peat pots, place the seedlings in the holes and cover the roots with soil until they're even with ground level. Water the soil just enough to keep it slightly moist for the first two weeks after you transplant the moonflowers if rainfall is less than 1 inch a week. Use a watering can when watering. You can also insert a stake about 1 inch away from the newly transplanted moonflowers if you don't have a trellis. Tie one end of a piece of heavy-duty twine to the stake and the other end to a nail or other protrusion sticking out of an adjacent wall. The moonflower vine will grow around the twine as long as it's taut. Moonflowers grow as perennials in U.S. Department of Agriculture plant hardiness zones 10 through 12 and as annuals in cooler climates.